Call C.J. at (720) 371-9081 or email at lifebythemoonyoga@gmail.com to register. 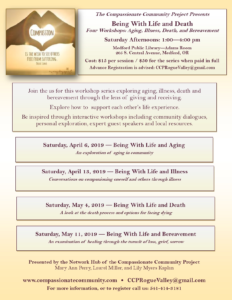 Join the us for this workshop series exploring aging, illness, death and bereavement through the lens of giving and receiving. Explore how to support each other’s life experience. Be inspired through interactive workshops including community dialogues, personal exploration, expert guest speakers and local resources. Feldenkrais Studio Jacksonville, 235 Main St. Call Jasmin at (541) 301-5097 or email her at jasmine321@gmail.com to register. This inaugural educational conference for healthcare professionals addresses health inequities and disparities that LGBTQ+ Southern Oregonians experience. CMEs/CUEs will be available at no additional cost.